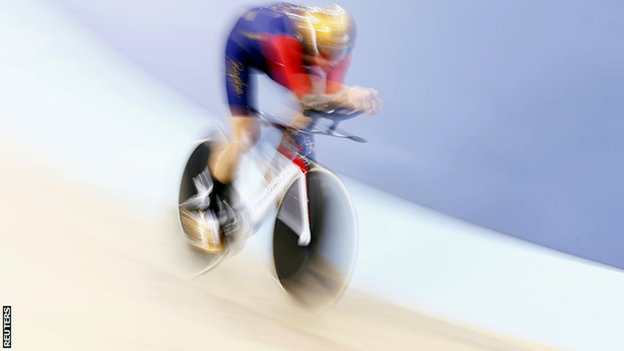 The 35-year-old smashed the record previously held by fellow Briton Alex Dowsett of 52.937km (32.89 miles), which was set in May. "I'm just glad it's done. It was torturous," he said. "That's the closest I have ever come to what it's like to a have a baby," Wiggins, who becomes the fifth person in the past nine months to break the record, joked. The multiple Olympic and world champion on track and road surpassed Dowsett's 212 laps, set in Manchester, with 1min 42secs to spare and eventually completed 219 laps. "You're constantly looking at the clock counting down. When you're out there, you never think it's coming to an end," he added. "I'm so pleased for him, it's his day and he is such a magnificent athlete."